Have you ever seen a truly beautiful historical building that someone slapped an ugly solar panel on? Do you think that Spanish style architecture needs to be compromised aesthetically to benefit the planet? The truth is that there are millions of flat roofs hidden from view and large expanses of desert land where conventional solar installations make a lot of sense. Colored Solar is NOT addressing this market. 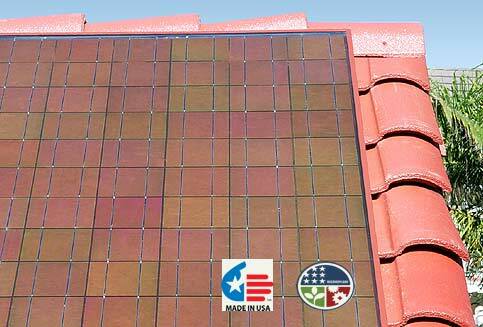 Colored Solar™ is pioneering colored solar energy solutions that efficiently capture sunlight and converts it to electricity, just like conventional systems, while also addressing the needs of many applications for architectural sensitivity and beautiful solutions. The time is near when the cost of PV will no longer be the primary consideration – it will be image, style, and evolution of the building envelope from container to power source. Colored Solar™ is leading the development, testing, and installation of what will be the new front of solar power market growth within 5 years. The integration of aesthetically pleasing solar PV into beautiful buildings and developments will not only enable the achievement of grid parity, but also validate a cost-effective pathway for reaching environmentally neutral energy independence. We are interested in investors who see the market potential of our game changing products and solutions. July 2013 - displaying our Stylish Solar Panels™. May 2013 - displaying our Stylish Solar Panels™. April 2013 - Christina Meredith, Ms. Ventura & Ms. California USA. August 2012 - California Electric Commission safety certification link. April 2012 - Ouranos Ltd has been appointed as International Distributor. March 2012 - displaying our Stylish Solar Panels™. September 2011 - Tested and validated Stylish Solar Panels™ at the US Department of Energy's National Renewable Energy Labs. October 2010 - Colored Solar LLC, the inventor of the Stylish Solar Panels™ Solar Power International 2010. According to Pike Research, annual value of the BIPV market will quadruple over the next five years, growing from $606 million in 2012 to more than $2.4 billion in 2017. Solar cell efficiency is increasing, cost is decreasing, and government incentives are making adoption of solar PV more attractive. However, there is still a resistance to installing standard PV panels where they cause a visible blight to architectural or historic elements. Colored Solar's™ products eliminate this barrier to adoption by offering colored and stylized solar panels that blend with and accent the architectural elements of buildings and historic places. • Can be mounted in and color matched to architectural features such as awnings, railings, sculptures, and roofing systems. Our patent pending high efficient PV mono/polycrystalline panels are designed and engineered to look better than black solar panels while performing equally well based on testing done at the US Department of Energy's National Renewable Energy Laboratory. With an exponential estimated growth in the PV industry, Stylish Solar Panels™ are positioned for incredible growth in sales, and market acceptance. The general target market would be hot, sun-drenched climates like California, Arizona, Hawaii, Texas, Nevada, and Florida. California is the largest grid connected United States market. Despite the difficult market environment for the solar industry as a whole, the opportunity for both building integrated photovoltaics (BIPV), and building-applied photovoltaics (BAPV) looks extremely promising. BIPV is set to become one of the fastest-growing segments in the solar industry with up to 4.6 GW of installations forecast through 2017. Until recently, aesthetic and performance concerns greatly limited the ability of architects to use BIPV/BAPV technology in their building designs, but this has been changing. With these features, BIPV will no longer be confined to spandrel or overhead applications. Rather, the entire building envelope will be able to put it to use, allowing the structure to produce its own power and feed additional power into the grid system. The United States has enormous, long-term growth potential for sustainable PV. The United States is home to an excellent photovoltaic resource. While the Southwest provides the highest insolation, or exposure to the sun’s rays, even northeastern states offer insolation that is, at a minimum, equal to or greater than the resources of Germany, who has invested more per capita than the US. Though there is ample availability of land for PV development, particularly in the Southwest, the urban and suburban areas represent a still largely untapped distributed expanse of power-producing surface area that is already connected to the grid. Increasing utilization of available urban surfaces will increase the need for PV products that can address the aesthetic considerations of these areas. Colored Solar™ specializes in delivering innovative applications of colored Stylish Solar Panels™, Architectural Accents™, and built-in solutions.